If you’ve been following my site (or my sister-in-law Helen Chandler’s site) for a while you’ll have twigged that she’s just about ready to pop with her second child. I was able to take time off this last week and squeeze in a quick trip down to London to go and visit her and the family. Partly to make a fuss of my niece (because soon I’ll have two to fuss over!) and also to try and be helpful for my sister-in-law. So I’ve been busy again putting together a little parcel to spoil her a bit during the last few weeks of pregnancy. 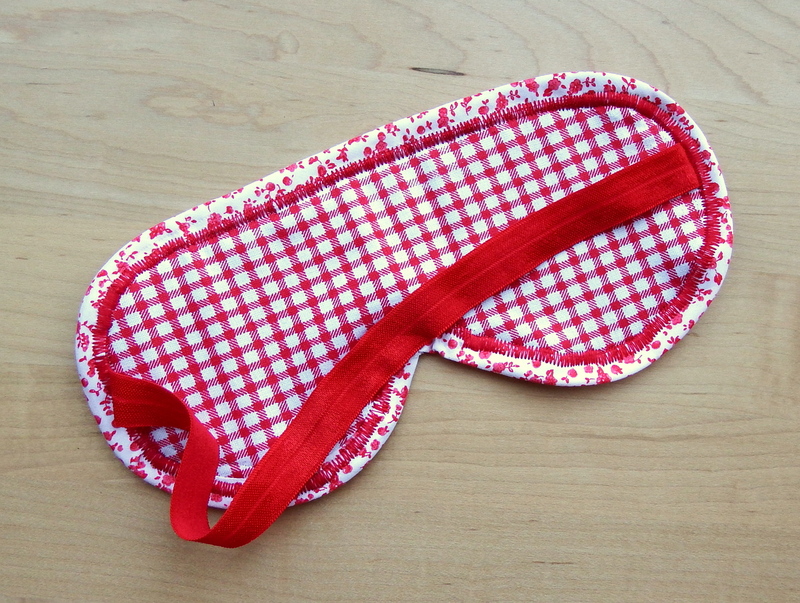 It contains one of my black-out eye masks (photo-tutorial here) so that she can nap whenever she likes (I suspect this will also be useful after the baby arrives). I chose red gingham and a printed bias binding, and I’m pretty pleased with the combo! 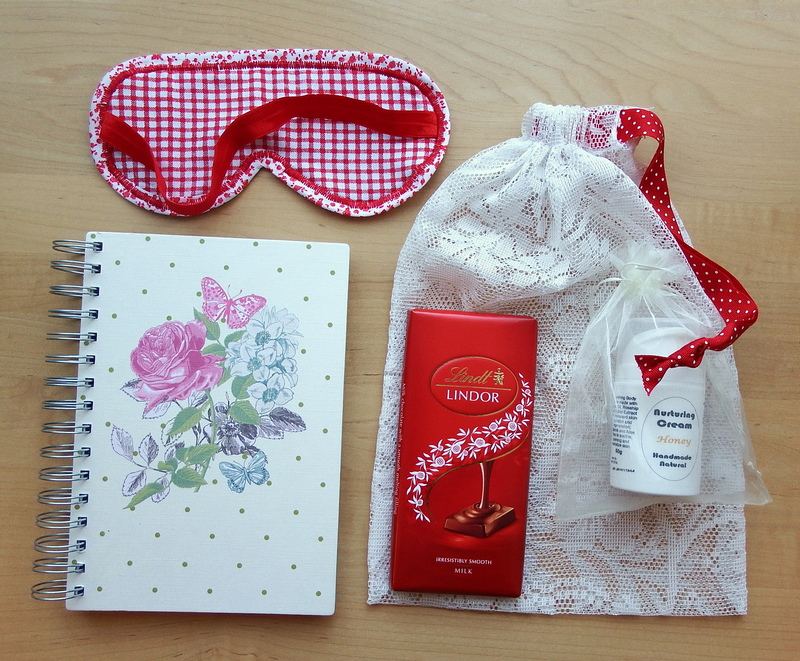 The other goodies include milk chocolate (always a necessity), and a notebook (because baby brain is real and so lists are needed!). Finally I included lovely all natural, homemade honey scented body cream. I didn’t make this myself – I have a friend who is very knowledgeable about beauty products who makes creams targeted at your particular skincare concerns (including gluten free skincare, for those who are uber-sensitive to wheat or are coeliac). 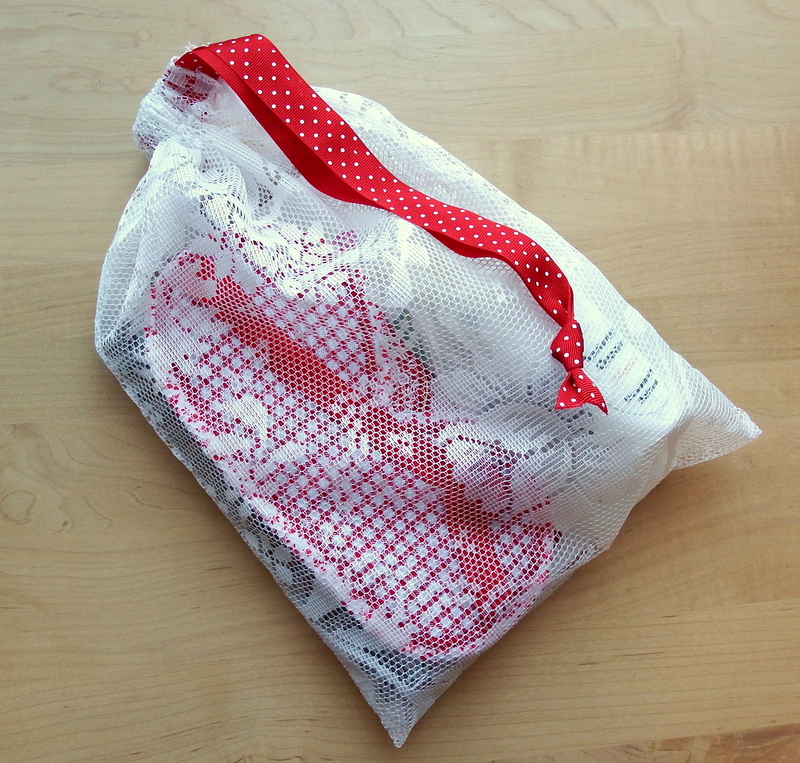 I parcelled it all up into a lacy drawstring bag (yes, I made this one!) 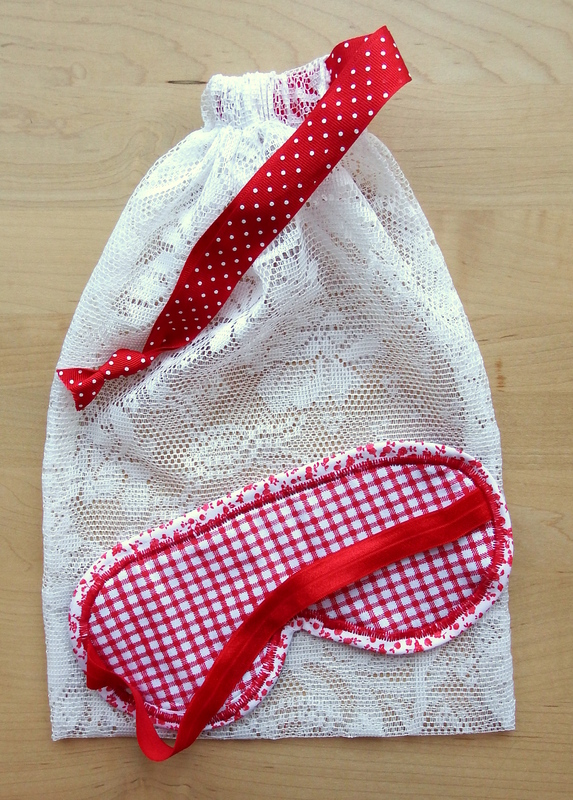 with a co-ordinating polka-dot ribbon. Don’t you just love polka-dots? So do you have any plans to spoil anyone special with homemade goodies or meals out this Christmas time? Esther, thank you so much for sharing your beautiful works, I live in Chile, and in these occasions I use to remember how much I love Internet!! I take this opportunity to wish you and your family a Merry Christmas!!!! Thank you Gloria! Yes, it’s great to be able to connect despite the distances apart! One day I would love to visit Chile :) Have a Merry Christmas too!